When I contemplate this years campaign, I realise how much my life has been affected by my skin conditions. Even at times when free of problems I still worry about its return, it is never far from my mind. My eczema is mild in comparison to the first ten years of my life. There are childhood memories which are upsetting and leave scars even to this day. The moment someone doesn't want to hold your hand in the playground in case they catch your "disease" to the fact I'm not a confident swimmer because I was "banned" from the pool (the chlorine tore apart my already sore skin). I hate baths and heavy creams because it reminds me of the emollients slathered on me morning, noon and night. I had a "soap" which was like lard and coal tar shampoo. When ever we use oilatum bath oil I had to be supervised because the bath tub became so slippy there was a danger of knocking yourself out if you lost your footing. I remember being 9 or 10 years old and wearing cotton gloves to bed because I would scratch in my sleep. My clothes were soiled from emollients and there was little I could so about it but I hated ruining new pajamas. My eczema may no longer be visible but it is there. People often compliment my skin which is kind of them but they don't see what's hiding underneath. Bra fittings are my least favourite chore, I always find myself explaining I have eczema and that I don't have the lurgy, you can't catch it. I'm unable to wear certain materials. I remember breaking out in a rash from wearing a new school cardigan and scratching until my arm was bleeding. I am always thinking about eczema. When I try and put it to the back of my mind, I fail as I'm reminded with every itch on my body. 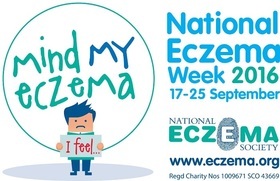 To find out more about National Eczema Week visit the National Eczema Society website.